You are here: Home / Articles / The Kansas City SMUG goes ‘Back to the Basics’! The Kansas City SMUG goes ‘Back to the Basics’! 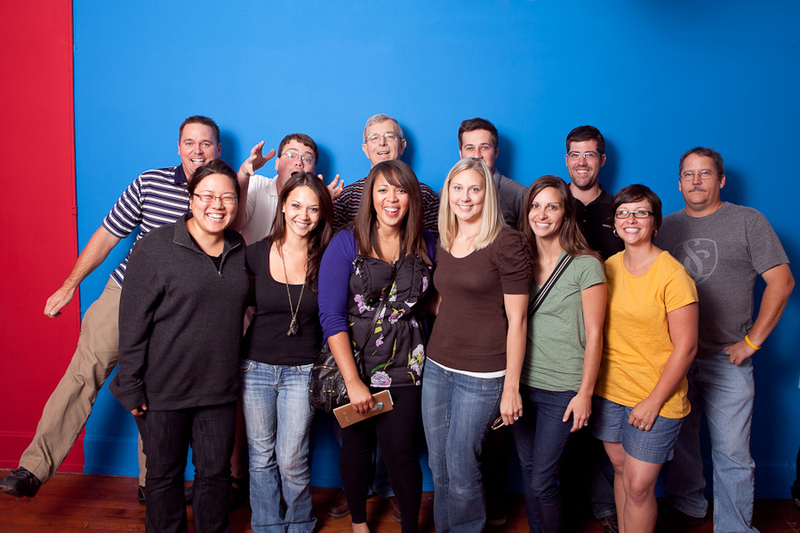 Last night was a really fun time meeting up with 13 other local photographers at our monthly Kansas City SmugMug meeting! We met at Layne Haley Photography’s studio in Strawberry Hill, Kansas. Our featured speaker was a local talent, Alea Lovely of Alea Lovely Videography + Photography. She is one seriously talented woman, and you can follow her on her blog at http://alealovely.tumblr.com. Her theme was “Back to the Basics” and she spoke about branding, videography with DSLRs, and how to set yourself apart in the market. She is an excellent speaker and you could just tell everyone was eager to hear more. She began by sharing stories about her journey in the photography business and how, in the beginning, she got so caught up in trying to emulate what everyone else was doing. “I forgot what I wanted to do… I lost myself,” she says. At that point in her life, she was fortunate to have the opportunity to move to England, where she had a chance to get away and start shooting for herself. She took this chance to really get to know her camera and figure out her own personal style. It was there that she started experimenting with videography with her DSLR and really fell in love with it. She also spoke about social media and how much it has revolutionized her business and her ability to connect with future clients. Alea encouraged us to start crafting our style and who we are and what we want our business to become. One of the most inspiring things I took away from last night was how a photograph should be beautiful, because you intentionally took it that way. How you compose the shot and finding the perfect light to shoot the picture the way we want it to look the first time, in camera and without a lot of post-processing, is key to a great photo. Join our Kansas City SMUG Meetup Group at http://www.meetup.com/Kansas-City-SMUG/ to get notifications of future meetings. Tina Kraemer of Pure in Art Photography (www.pureinart.com) is a wedding and portrait photographer based in the greater Kansas City metro area. Her favorite camera is my 5DMII, and she loves shooting people in the beautiful sunlight during autumn evenings! She also loves her Kansas City SMUG, because they have talented and inspiring speakers, and the photographers who attend are always willing to share and learn from each other.